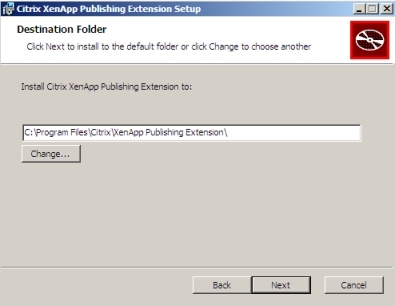 In 2009 Citrix released a utility called Citrix XenApp Publishing Extension. In this Glance at Free article we will look what the Extension of the utility and if this is real add-on to the current default Citrix management consoles. First find out what the extension exactly is of this utility. Maybe you would expect that the utility adds additional functionality into one of the Citrix Management Consoles, however this is not true. Actually the extension is a (kind of) standalone utility which simplifies the process of publishing applications within a Citrix infrastructure. The utility is provided as a MSI installation file, which can be downloaded from the Citrix website. The utility is only support on Citrix Presentation Server/XenApp 4.5 (for Windows 2003) or XenApp 5 (for Windows 2008). Both 32 bit as 64 bit is supported. The software needs to be installed on one of Citrix Servers in the farm, as a prerequisite also .Net Framework 3.5 SP1 is needed. In my demo environment I used Windows 2008 with XenApp5 for this article. The installation is a pretty straight forwarded process with the default installation windows. The only thing can you provide during the installation is the destination location where the software will be installed. After the installation is finished no reboot is required, you can directly start using the utility. Instead of most utilities you will not find a shortcut in the Start Menu, but the utility adds an additional option in the context menu when the right mouse button is used on an application shortcut (.lnk file) or an executable. 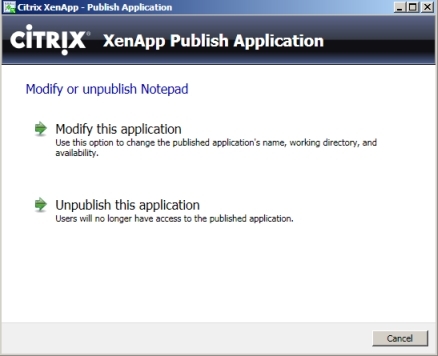 This new option the menu has the (logical) name "Publish to XenApp". Choosing this option will start a wizard asking the required information to publish the application within the Citrix Datastore. The first window shown asks you the name of the Published Application, the executable and working directory is automatically filled in. Other information you can provide is the server(s) hosting the application and the assignment of the application to group. 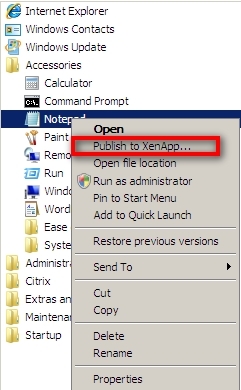 When the application is already published with the Citrix infrastructure, you can also use the utility to change the current Published Application via the same methodology (so selecting the shortcut/executable and choosing "Publish to XenApp" out of the right mouse button context menu). The above displayed figure will be display, so you have the option to change the settings Published Application Name, Working Directory (you can also manually change the executable), the servers hosting the application and the assigned group. In both scenarios you cannot configure any advanced features like the encryption level, display settings and more. Those settings will be configured with the default configuration of the Citrix infrastructure and can only be changed within the default Citrix Management Consoles. The Citrix Xenapp Publishing Application utility can be useful to create quickly the Published Application, because less wizard windows are shown than using the default console. So if you the start menu fully filled, this will be quicker. The biggest disadvantage is that the advanced settings cannot be configured so in most cases you still need to go to the management console to change such settings.